8 months after the original announcment of the Nokia 7700 media device, the company cancelled the handset without going in to too many details. We'll explore the possible reasons later in this article, but we feel that this is a shame, because if Nokia had a handset that could outclass the Sony Ericsson P900, then the Nokia 7700 is it - well, for now anyway. Nokia dubbed the 7700 a "media device" rather than a phone, and it's clear to see why. The most obvious feature in the 640x320 pixel touch-sensitive display, enormously bigger than everything else currently on the market and much bigger that the P900. Indeed, the only thing that comes close is the display on the Nokia 9500. There's no keyboard at all on the 7700, and it's a side-talking taco shell handset like the original Nokia N-Gage, which probably counted against it when Nokia reviewed the project. Also unique is the Symbian Series 90 operating system, the most advanced OS to be found in any Symbian based handset. 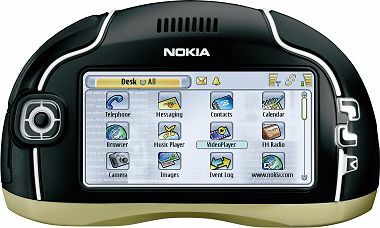 Even the powerful Nokia 9500 Communicator only sports the less powerful Series 80 OS. There's a full set of office compatible applications, an Opera web browser and lots of multimedia enhancements too. The 7700 was designed with a VGA resolution digital camera, FM radio, GPRS, EDGE, HSCSD, Bluetooth and really the full range of features you'd expect with a Smartphone of this type. The lovely 640 pixel wide display is ideal for web browsing and email, an advantage similarly shared by the Nokia 9210i and 9500 series. Combine the powerful hardware and software together, and you start to get a truly smart Smartphone. So why did Nokia ditch the 7700 project? Well, we think there are several factors at work here. Firstly, Nokia's declining market share has been well documented, and many observers think that Nokia has taken it's eye off the ball with too many esoteric projects, such as the N-Gage QD, 9500 Communicator, and other oddities, while ignoring the vital mid-range of the market. Secondly, the Nokia 7700 was announced back in November 2003 and by June 2004 was still nowhere to be seen. Eight months is a long time in the mobile phone business, and certainly elements were beginning to look obsolete. Thirdly, the Nokia 7700 isn't terribly attractive phone. It's large, heavy, lacks a keyboard and it difficult to use as a telephone handset. At an estimated retail price of �800/�500/$900 this is a hugely expensive handset too, and possibly Nokia weren't prepared to take the financial risk. After all, the only similar phone in their current inventory, the Nokia 9210i Communicator has been a very slow seller indeed. We understand that Nokia will have some 7700s in circulation as technology samples, and that work on the Series 90 OS will continue with the intent to bring it to play in another Smartphone later. Possibly this new project will be the rumoured Nokia 9300 lightweight Communicator. All-in-all, we're a little sad at the demise of the Nokia 7700. As a handset it seems ideally suited to those who would sooner surf the web or play back media than make phone calls, and this is a growing market. Hopefully Nokia can take away the 7700 concept and come back with something truly polished later this year.